As I've mentioned before, my closet floor is cluttered with shoes. I have collected, a few! So, I decided it was time to sort through them and tidy things up a bit. Shoes bring back lots of good and sometimes not so good memories. I have my all time favorites that are lovingly held together with duct tape. 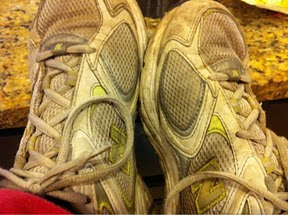 I still wear them, because they are comfortable and they've been in my life for many years. I bought them in Texas. There's the red shoes, I don't wear them nearly as often, that I bought very impulsively and have found that they are not as comfortable. I have a pair of clogs that I wear pretty often, when it's not raining or snowing, so maybe not that often. In the summer I stick to sandles, keepiing my feet free and cool. I've got plain ones, and jeweled ones. And, flowered flip flops. And, then of course there's all the boots. I have short boots, tall boots, medium boots. I have really warm boots, cowboy boots, rain boots. My encounter with the closet floor and my footwear took me awhile. And, then the next day when I went in my closet to get my shoes, I couldn't find them! It was so tidy, it set me back. "Where did I put those shoes?" I've adjusted a little more to the tidy floor, and shoe rack, but I have this sneaking suspicion that it won't stay that way for a long time. So much like life! Messy, clean it up, messy again! As I move along and step into the path of God's light, I sometimes look back on the trail behind me and see where I have traveled and what life has given along the way. It's required a lot of different shoes to get through. One path, several shoes! Sometimes, the shoes I've chosen to wear have been very uncomfortable, others have been so nice, I keep wearing them until they have holes in them. Some have been neatly tucked away and pulled out for special occasions. Whatever the shoe for the day, I have learned that God makes the steps. He is the path on which I must walk and He determines the pace. He is the One that completes my wardrobe. He clothes me and enables me to fit in uncomfortable and comfortable shoes. When I walk through the rocky parts, He provides boots for me, and He warms me. He is there when it gets messy, and when I need quiet waters to rest by, He leads me there and soothes my soul. He is the perfect fit for every situation. 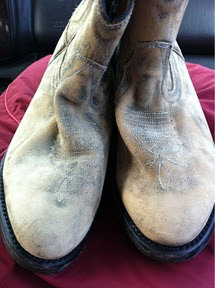 Today, I'm expecting a new pair of boots. They should be coming in the mail, and when they do, I plan to wear them. I hope they fit okay. I've been anticipating their arrival for awhile now, and I'm curious about the path we will walk on together. Just like my life, I'm anticipating what will happen today, tomorrow, and next month. With Jesus, it will be an adventure worth walking. I'm excited to be a part of His closet, and to experience the fullness of life with Him. I'm going to Say That Again! Jesus, I've got my shoes on, lets go!